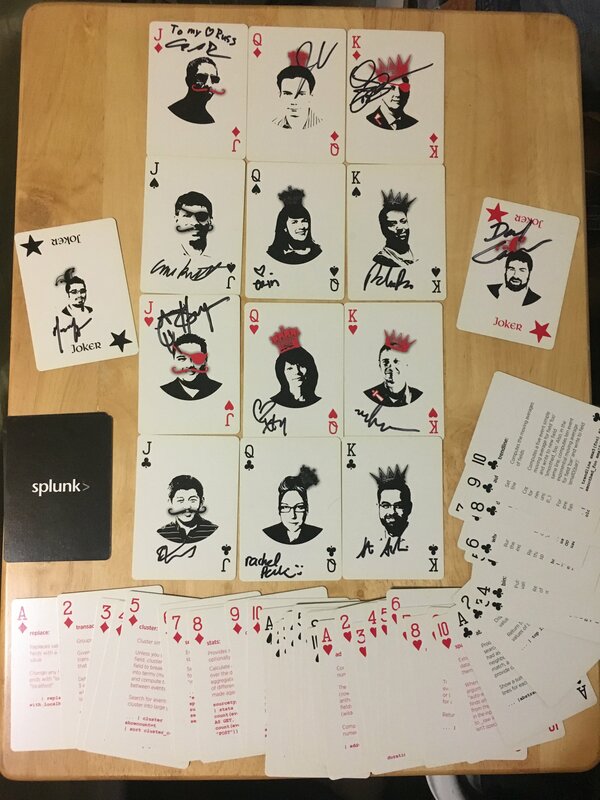 The deck of Splunk playing cards was thought up by Monzy Merza. The thought being, it would be a slightly different way for people to learn search commands. The face cards are all the pictures of a number of long time Splunk employees, primarily trying to get folks who were influential in the development of SPL. 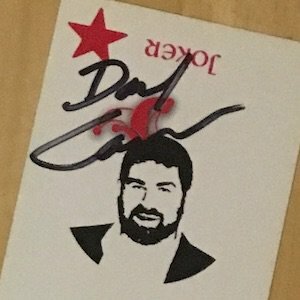 Russell Uman took his copy of the deck one step further, and got all of the face cards signed by the corresponding people. The deck was initally distributed at a .conf… believed to be 2013 (but could be off). A joker because he was the biggest joker that Splunk had. The deck was his idea. One of Splunk’s original developers, very involved in the IRC community. Very involved with product management for the core platform … But why a Queen? Well, for a while Splunk was forced to implement a no-personal packages policy at Splunk, primarily because Johnathon’s daily dose of clothing shipments begun to take up a not insignificant amount of space. Of course this policy was quickly overturned when George Yoshinaga, the creator of said policy, needed to have some surfboards shipped to the office. The Duke of Fun… Why the Duke? Princes have actual responsibility. But Dukes get the title without any real responsibility. Therefore, Karandeep wanted to be the Duke of Fun. Founder of Splunk4Good, and the Project Management Org. Erin actually wanted this to be Vi Ly since Vi is the most clicked Splunk Expert, been around longer, and helped so many be successful, but the design team had other ideas.